Things never came easy for Marvelous Marvin Hagler. Joe Frazier once said to him “You’ve got three things going against you; You’re black, you’re a southpaw, and you are good”. Joe was right. Marvin had to do it the hard way. Even before he won the title Hagler was taking on the toughest middleweights in the world, and he was doing it for short money. Even before he won the title Hagler was taking on the toughest middleweights in the world, and he was doing it for short money. In his fourth fight he took on local rival and outstanding amateur star Dornell Wigfall over whom he won a decision. He would win by a knockout in a rematch. In his 15th fight he beat Olympic Gold Medal winner Sugar Ray Seales. 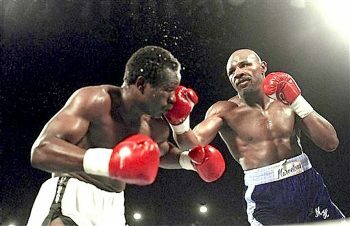 In a rematch in Seales’s hometown Marvin would be given a draw in a fight Marvin won easily, and in a third match in Boston Hagler removed all doubt by destroying Seales in one round. Marvin would go on to beat the undefeated knockout artist Johnny Baldwin. After that fight, promoter J. Russell Peltz invited Hagler down to Philadelphia to try his hand against the best fighters the City of Brotherly Love had to offer. He took on Bobby Boogaloo Watts and lost a highly disputed decision. Next was Willie The Worm Monroe who beat Marvin fair and square though Hagler would come back to kayo Monroe in two rematches. There were more victories against the likes of the murderous punching Eugene Cyclone Hart, Bennie Briscoe, Mike Colbert, Kevin Finnegan, and Doug Demmings. Remember, these fights were all before the Marvelous One had won the title. 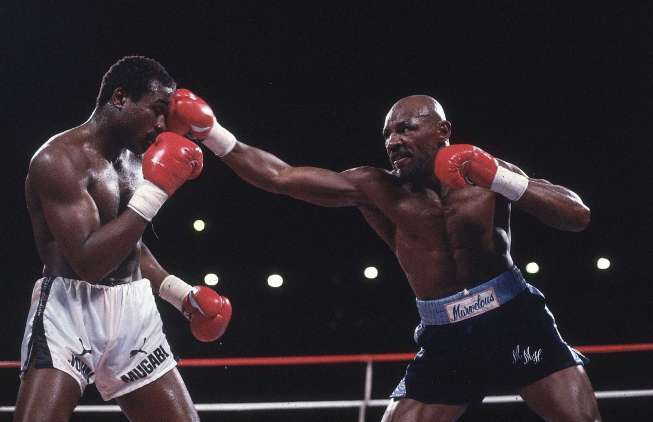 In fact, it wasn’t until his 55th bout that Hagler finally got a shot at the title only to be the victim of a terrible decision when, after clearly winning over fifteen rounds, the judges called his bout against Vito Antoufermo a draw. Hagler would have to wait a year before getting another title shot, this time against the new champion Alan Minter. Marvin left nothing to chance by destroying Minter in the third round and finally, finally taking possession of the title. Marvelous Marvin would successfully defend his title 12 times against the best and only Roberto Duran was able to last the distance with him. Out of those defenses the one most talked about was his war against Tommy Hearns in which Marvin stopped the Motor City Cobra in the third round of one of the most exciting fights in history. After that fight Hagler would make one more defense of the title before his showdown with Sugar Ray Leonard in 1987. It is that fight against John “The Beast” Mugabi that has somehow become lost when talk of Marvin’s career comes up. That is a shame because it very well may have been his finest hour. It also may give some clues to why Marvin fought the way he did against Leonard. John Mugabi, from Uganda fighting out of England, was a natural boxer/puncher. He had incredible power in both hands and was also blessed with a chin made out of iron. He had earned a shot at Halger by beating a number of other up and coming middleweights and doing so in impressive style, knocking out all 25 of his opponents. The fight took place on March 10, 1986 outdoors on a cool evening in Las Vegas. While Mugabi did not have anything matching Marvin’s experience, he did enter the ring with intense confidence and showed no fear of Hagler. It was just short of a year after Hagler’s war with Hearns and from the opening bell looked very much like it would be a repeat of that fight as Mugabi came out throwing bombs. There was one difference though, The Beast could also take the best Marvin had to offer and the grueling match went on for 11 rounds. While there were moments when the intensity would ebb just a bit, this was all out war. I had seen just about all of Hagler’s fights going back to his amateur days and had never seen him rocked the way he was against Mugabi. The two traded monstrous punches round after round with Marvin staying ahead but at the same time absorbing some unbelievable blows. You saw two things in this fight that were very rare in a Hagler bout; Marvin’s head snapping back from the force of the uppercuts Mugabi was landing, and Hagler being forced to give ground. Also, Marvin’s left eye was almost completely closed by the end of the fight. But, as the saying goes, you should have seen the other guy. This was like an extended version of the Hagler/Herans fight. While all rounds of the fight were exciting, it was the 6th that really stands out. In that round Hagler came out determined to end matters, and it appeared he would do just that as he unloaded with brutal blows to Mugabi’s chin. The Beast was rocked, he was forced back, he looked on the verge of crumbling, but then he came back to life and was rocking Halger with bombs of his own. The crowd was on its feet cheering as the round ended. After that it became a battle of attrition. Marvin was relentless in the fashion of Rocky Marciano. He wore Mugabi down and by the 11th round the effects of the punches and exhaustion put Mugabi down for the count. Marvin had dug down and showed what a champion is made of. Hagler survived punches that would have sunk a battle ship yet never was discouraged. Mugabi took monster shots from Hagler and kept coming. This was like an extended version of the Hagler/Herans fight. Marvin would next fight Ray Leonard who had said he saw something in the Mugabi fight that told him he could beat Marvin. He felt he could outbox him after that night. Going into the Leonard fight Marvin was coming off two brutal wars; The battle with Hearns and the war with Mugabi. 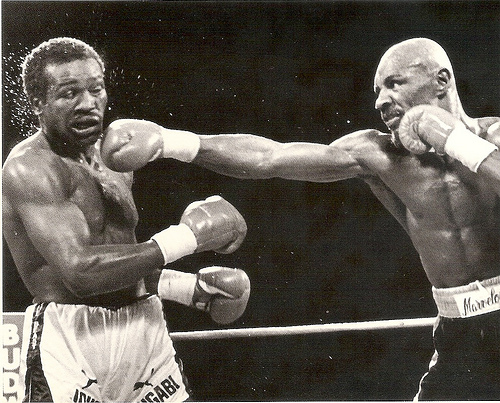 Hagler had no easy touch in between, but then again, nothing ever was easy for Hagler. I have always thought Marvin made a tactical mistake in the Leonard fight by not pressing Ray early. He allowed Leonard to get a rhythm and to gain confidence in the early rounds. I believe that Hagler, having just had two brutal wars, wanted to show the public he could outbox Leonard, beat him at his own game. I think if he had shown the same intensity he had displayed against Hearns and Mugabi he would have stopped Leonard. I still think Marvin deserved the decision in the fight, but once again, he couldn’t catch a break. I do know one thing. Marvelous Marvin Hagler showed just why he was a great champion the night he stopped John Mugabi. He not only showed his talent, conditioning, punching power, and indestructible chin, he showed that indomitable “will to win” that makes for a very great champion. Marvin ranks high on the list of all time greats, and he earned that designation the hard way. We will never again see the likes of a Marvelous Marvin Hagler.